A number of industries are due to undergo huge changes in 2018 and they’ll be looking for change managers to help them transform. Business change recruitment specialist Baiba Ziga reveals which industries business change professionals should look to for a new challenge in 2018 and beyond. Technology and healthcare are becoming so closely linked that a whole sector of the tech industry, known as HealthTech, has emerged to cater to the need for healthcare innovation. In an industry historically associated with paper-based recording systems for check-ups, innovations are changing its traditional delivery. As such, business change experts will be in high demand to help health organisations shift from traditional to digital methods. With often unbearable queues in A&E, on-demand consultancy is now available but hasn’t quite taken off yet, despite some recent advertisements you may have seen on TV. Once the premise of ‘online doctors’ goes mainstream, Business Change Managers will be needed to overcome the challenges of scaling up consultancies and helping organisations adapt to a different culture of working. Over recent years, consumer spending patterns have changed dramatically. Consumers are becoming increasingly accustomed to digital technology in the shopping environment and will judge a retailer on the digital experience it offers. With human attention spans at a record low (less than 8 seconds), any inefficiencies, long loading times or lengthy purchase procedures will drive the consumer away, possibly to a competitor. Consumers now expect one-click purchases, fast delivery, and an easy experience. All of the above create supply chain implications, so Business Change Managers will be needed to support with the communication and management of these new systems. Inspired by FinTech, now a mature term in the Financial Services industry, the aim of Insurance Technology (InsurTech) is to increase savings and improve the efficiency of the current insurance industry model. Large insurance companies are well aware of the emergence of this industry and are already actively investing in InsurTech innovation by partnering with start-ups to utilise their technology. Travel insurance is one type of on-demand insurance that is already available, but there are many ways to use technology to create other on-demand insurance. Many consumer and employee perceptions will have to be changed to scale these products and services up quickly, and this is where a Change Manager comes in. Within transportation, we are already seeing self-driving or driverless cars being tested - particularly in Silicon Valley. This has led to lots of government and private investment in this sector. The petrol and diesel car ban in 2040 will be the biggest change for automotive manufacturers, who will need to radically improve their existing combustion engine technologies and communicate the benefits to consumers. With around 36 million cars on the road in the UK, you can see the scale and impact the ban will have. And it’s a revolution which will require Business Change Managers to navigate businesses through this transition. Additionally, the rail industry is undergoing rapid transformation with High Speed Two (HS2) in the UK and other major projects worldwide. Billions of dollars are being invested in developing these major infrastructure projects, which will also need business change experts to keep the projects on track. The sharing of information across various locations internationally presents massive opportunities to the education sector. Education Technology (EdTech) enables this transfer of knowledge across borders. However, many education institutes have relied on paperwork and private systems to store their records, which will present a challenge when shifting to online or cloud-based systems. Business Change Managers will need to communicate the benefits of these new systems and win over difficult stakeholders who are happy with the status quo. Technology advancements are effecting positive change in some of the most mature and established industries; reinventing the services they provide and the way they do business. For businesses in these sectors to remain successful, they will need to keep up with the pace of change to bring about the best offering to the consumer. 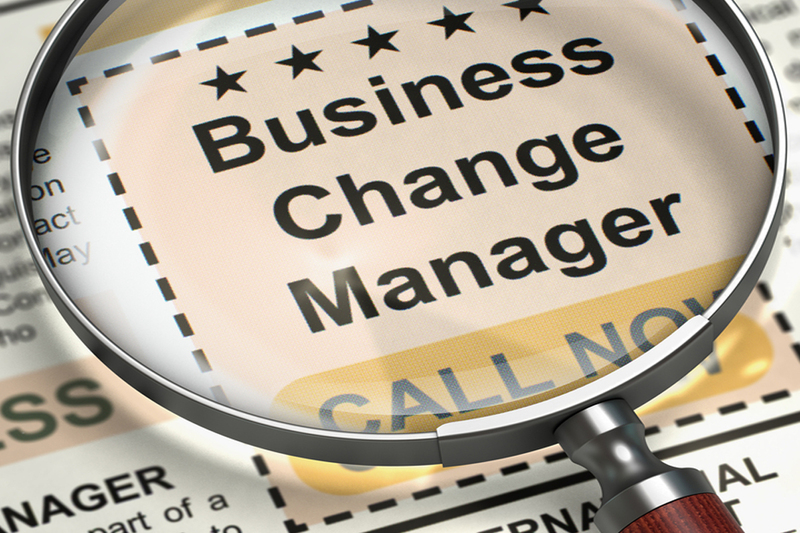 Without the support of Business Change Managers, this change cannot be achieved to its full potential so people with business change experience can expect to be in demand in the year ahead and beyond. View our latest business change jobs. Baiba Ziga is an experienced recruitment consultant specialising in Business Change & Technology recruitment solutions, with a genuine interest and passion for digital change and innovation.